The Native American Party, renamed the American Party in 1855 and commonly known as the Know Nothing movement, was an American nativist political party that operated nationally in the mid-1850s. It was primarily anti-Catholic, xenophobic, and hostile to immigration, starting originally as a secret society. The movement briefly emerged as a major political party in the form of the American Party. Adherents to the movement were to reply "I know nothing" when asked about its specifics by outsiders, thus providing the group with its common name. The collapse of the Whig Party after the passage of the Kansas–Nebraska Act left an opening for the emergence of a new major party in opposition to the Democrats. The Know Nothings elected congressman Nathaniel P. Banks of Massachusetts and several other individuals in the 1854 elections and created a new party organization known as the American Party. Particularly in the South, the American Party served as a vehicle for politicians opposed to the Democratic Party. Many also hoped that it would seek a middle ground between the pro-slavery positions of many Democratic politicians and the anti-slavery positions of the emerging Republican Party. The American Party nominated former President Millard Fillmore in the 1856 presidential election, although he kept quiet about his membership. Fillmore received 21.5% of the popular vote in the 1856 presidential election, finishing behind the Democratic and Republican nominees. The party declined rapidly after the 1856 election. The 1857 Dred Scott v. Sandford decision further aroused opposition to slavery in the North, where many Know Nothings joined the Republicans. Most of the remaining members of the party supported the Constitutional Union Party in the 1860 presidential election. Anti-Catholicism had been a factor in colonial America but played a minor role in American politics until the arrival of large numbers of Irish and German Catholics in the 1840s. It then reemerged in nativist attacks on Catholic immigration. It appeared in New York politics as early as 1843 under the banner of the American Republican Party. The movement quickly spread to nearby states using that name or Native American Party or variants of it. They succeeded in a number of local and Congressional elections, notably in 1844 in Philadelphia, where the anti-Catholic orator Lewis Charles Levin, who went on to be the first Jewish congressman, was elected Representative from Pennsylvania's 1st district. In the early 1850s, numerous secret orders grew up, of which the Order of United Americans and the Order of the Star Spangled Banner came to be the most important. They merged in New York in the early 1850s as a secret order that quickly spread across the North, reaching non-Catholics, particularly those who were lower middle class or skilled workmen. The immigration of large numbers of Irish and German Catholics to the United States in the period between 1830 and 1860 made religious differences between Catholics and Protestants a political issue. Violence occasionally erupted at the polls. Protestants alleged that Pope Pius IX had put down the failed liberal Revolutions of 1848 and that he was an opponent of liberty, democracy and republicanism. One Boston minister described Catholicism as "the ally of tyranny, the opponent of material prosperity, the foe of thrift, the enemy of the railroad, the caucus, and the school". These fears encouraged conspiracy theories regarding papal intentions of subjugating the United States through a continuing influx of Catholics controlled by Irish bishops obedient to and personally selected by the Pope. In spring 1854, the Know Nothings carried Boston, Salem, and other New England cities. They swept the state of Massachusetts in the fall 1854 elections, their biggest victory. The Whig candidate for mayor of Philadelphia, editor Robert T. Conrad, was soon revealed as a Know Nothing as he promised to crack down on crime, close saloons on Sundays and to appoint only native-born Americans to office—he won by a landslide. In Washington, D.C., Know Nothing candidate John T. Towers defeated incumbent Mayor John Walker Maury, causing opposition of such proportion that the Democrats, Whigs, and Freesoilers in the capital united as the "Anti-Know-Nothing Party". In New York, in a four-way race the Know Nothing candidate ran third with 26%. After the 1854 elections, they claimed to have exerted decisive influence in Maine, Indiana, Pennsylvania, and California, but historians are unsure due to the secrecy as all parties were in turmoil and the anti-slavery and prohibition issues overlapped with nativism in complex and confusing ways. They helped elect Stephen Palfrey Webb as Mayor of San Francisco and J. Neely Johnson as Governor of California. Nathaniel P. Banks was elected to Congress as a Know Nothing candidate, but after a few months he aligned with Republicans. A coalition of Know Nothings, Republicans and other members of Congress opposed to the Democratic Party elected Banks to the position of Speaker of the House. The key to Know Nothing success in 1854 was the collapse of the second party system, brought about primarily by the demise of the Whig Party. The Whig Party, weakened for years by internal dissent and chronic factionalism, was nearly destroyed by the Kansas–Nebraska Act. Growing anti-party sentiment, fueled by anti-slavery sentiment as well as temperance and nativism, also contributed to the disintegration of the party system. The collapsing second party system gave the Know Nothings a much larger pool of potential converts than was available to previous nativist organizations, allowing the Order to succeed where older nativist groups had failed. In San Francisco, California, a Know Nothing chapter was founded in 1854 to oppose Chinese immigration—members included a judge of the state supreme court, who ruled that no Chinese person could testify as a witness against a white man in court. In the spring of 1855, Know Nothing candidate Levi Boone was elected mayor of Chicago and barred all immigrants from city jobs. Abraham Lincoln was strongly opposed to the principles of the Know Nothing movement, but did not denounce it publicly because he needed the votes of its membership to form a successful anti-slavery coalition in Illinois. Ohio was the only state where the party gained strength in 1855. Their Ohio success seems to have come from winning over immigrants, especially German American Lutherans and Scots-Irish Presbyterians, both hostile to Catholicism. In Alabama, Know Nothings were a mix of former Whigs, discontented Democrats and other political outsiders who favored state aid to build more railroads. Virginia attracted national attention in its tempestuous 1855 gubernatorial. Democrat Henry Alexander Wise won by convincing state voters that Know Nothings were in bed with Northern abolitionists. With the victory by Wise, the movement began to collapse in the South. The Know Nothings also dominated politics in Rhode Island, where in 1855 William W. Hoppin held the governorship and five out of every seven votes went to the party, which dominated the Rhode Island legislature. Local newspapers such as The Providence Journal fueled anti-Irish and anti-Catholic sentiment. On 6 August 1855, rioting broke out Louisville, Kentucky, during a hotly contested race for the office of governor. 22 were killed and many injured. This "Bloody Monday" riot was not the only violent riot between Know Nothings and Catholics in 1855. In Baltimore, the mayoral elections of 1856, 1857, and 1858 were all marred by violence and well-founded accusations of ballot-rigging. In Maine, Know Nothings were associated with the tarring and feathering of a Catholic priest, Father Johannes Bapst, in the coastal town of Ellsworth in 1851 and the burning of a Catholic church in Bath in 1854. In the South, the American Party was composed chiefly of ex-Whigs looking for a vehicle to fight the dominant Democratic Party and worried about both the pro-slavery extremism of the Democrats and the emergence of the anti-slavery Republican party in the North. In the South as a whole, the American Party was strongest among former Unionist Whigs. States-rightist Whigs shunned it, enabling the Democrats to win most of the South. Whigs supported the American Party because of their desire to defeat the Democrats, their unionist sentiment, their anti-immigrant attitudes and the Know Nothing neutrality on the slavery issue. In Louisiana and Maryland, the Know Nothings enlisted native-born Catholics. Know Nothing congressman John Edward Bouligny was the only member of the Louisiana congressional delegation to refuse to resign his seat after the state seceded from the Union. In Maryland, the party's influence lasted at least through the Civil War: the American Party's Governor and later Senator Thomas Holliday Hicks, Representative Henry Winter Davis, and Senator Anthony Kennedy, with his brother, former Representative John Pendleton Kennedy, all supported the United States in a State which bordered the Confederate states. Historian Michael F. Holt argues that "Know Nothingism originally grew in the South for the same reasons it spread in the North—nativism, anti-Catholicism, and animosity toward unresponsive politicos—not because of conservative Unionism". Holt cites William B. Campbell, former governor of Tennessee, who wrote in January 1855: "I have been astonished at the widespread feeling in favor of their principles—to wit, Native Americanism and anti-Catholicism—it takes everywhere". The party declined rapidly in the North after 1855. In the presidential election of 1856, it was bitterly divided over slavery. The main faction supported the ticket of presidential nominee Millard Fillmore and vice presidential nominee Andrew Jackson Donelson. Fillmore, a former President, had been a Whig and Donelson was the nephew of Democratic President Andrew Jackson, so the ticket was designed to appeal to loyalists from both major parties, winning 23% of the popular vote and carrying one state, Maryland, with eight electoral votes. Fillmore did not win enough votes to block Democrat James Buchanan from the White House. During this time, Nathaniel Banks decided he was not as strongly for the anti-immigrant platform as the party wanted him to be, so he left the Know Nothing Party for the more anti-slavery Republican Party. He contributed to the decline of the Know Nothing Party by taking two-thirds of its members with him. 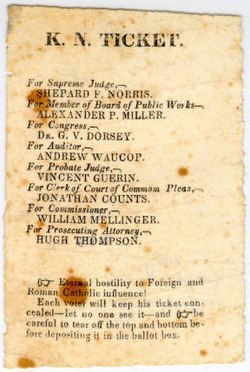 After the Supreme Court's controversial Dred Scott v. Sandford ruling in 1857, most of the anti-slavery members of the American Party joined the Republican Party. The pro-slavery wing of the American Party remained strong on the local and state levels in a few southern states, but by the 1860 election, they were no longer a serious national political movement. Most of their remaining members supported the Constitutional Union Party in 1860. The spirit which enacted the Alien and Sedition laws, the spirit which actuated the "Know-nothing" party, the spirit which is forever carping about the foreign-born citizen and trying to abridge his privileges, is too deeply seated in the party. The aristocratic and know-nothing principle has been circulating in its system so long that it will require more than one somersault to shake the poison out of its bones. The term has become a provocative slur, suggesting that the opponent is both nativist and ignorant. George Wallace's 1968 presidential campaign was said by Time to be under the "neo-Know Nothing banner". Fareed Zakaria wrote that politicians who "encourage[d] Americans to fear foreigners" were becoming "modern incarnations of the Know-Nothings". In 2006, an editorial in The Weekly Standard by neoconservative William Kristol accused populist Republicans of "turning the GOP into an anti-immigration, Know-Nothing party". The lead editorial of the May 20, 2007 issue of The New York Times on a proposed immigration bill referred to "this generation's Know-Nothings". An editorial written by Timothy Egan in The New York Times on August 27, 2010 and entitled "Building a Nation of Know-Nothings" discussed the birther movement, which falsely claimed that Barack Obama was not a natural-born United States citizen, which is a requirement for the office of President of the United States. In the 2016 United States presidential election, a number of commentators and politicians compared candidate Donald Trump to the Know Nothings due to his anti-immigration policies. The American Party was represented in the 2002 film Gangs of New York, led by William "Bill the Butcher" Cutting (Daniel Day-Lewis), the fictionalized version of real-life Know Nothing leader William Poole, who was also the real life leader of the Bowery Boys. The Know Nothings also play a prominent role in the historical fiction novel Shaman by novelist Noah Gordon. ^ Kemp, Bill (17 January 2016). "'Know Nothings' Opposed Immigration in Lincoln's Day". The Pantagraph. Retrieved 11 April 2016. ^ Tyree, Rene (29 December 2008). "Order of the Star Spangled Banner". wig-wags.worldpress.com. Retrieved 15 November 2017. ^ Michael C. LeMay (2012). Transforming America: Perspectives on U.S. Immigration. ABC-CLIO. p. 150. ISBN 978-0-313-39644-1. ^ Richard Lawrence Miller (2012). Lincoln and His World: Volume 4, The Path to the Presidency, 1854–1860. McFarland. pp. 63–4. ^ Mulkern (1990). The Know-Nothing Party in Massachusetts: The Rise and Fall of a People's Movement. pp. 101–2. ^ Maine Historical Society, Maine: A History, (1919) Volume 1, lsworth&f=false pp. 304–5 online. ^ Frederick, Jeff (2002). "Unintended Consequences: The Rise and Fall of the Know-Nothing Party in Alabama". Alabama Review. 55 (1): 3–33. Retrieved 23 January 2017. ^ Anbinder, Tyler (1992). Nativism and Slavery: The Northern Know Nothings and the Politics of the 1850s. New York, New York: Oxford University Press. p. 167. ISBN 978-0-19-507233-4. ^ Bouligny, John Edward (5 February 1861). Feb. 5, 1861: Secession of Louisiana (PDF) (Speech). Speech in the House of Representatives. Washington, D.C. Archived from the original (PDF) on 2 February 2017. Retrieved 23 January 2017. ^ Holt, Michael F. (1999). The Rise and Fall of the American Whig Party: Jacksonian Politics and the Onset of the Civil War. New York, New York: Oxford University Press. p. 856. ISBN 978-0-19-516104-5. ^ Browne, Francis Fisher (1914). The Every-day Life of Abraham Lincoln: A Narrative and Descriptive Biography with Pen-pictures and Personal Recollections by Those Who Knew Him. Browne & Howell. p. 153. Retrieved 28 August 2015. ^ Anbinder, Tyler (1992). Nativism and Slavery: The Northern Know Nothings and the Politics of the 1850s. New York: Oxford University Press. p. 270. ISBN 9780195072334. OCLC 925224120. ^ Richard J. Jensen. The Winning of the Midwest: Social and Political Conflict, 1888–96 (1971) pp. 108, 147, 160. ^ "The Immigration Deal", The New York Times, May 20, 2007. ^ Egan, Timothy. "Building a Nation of Know-Nothings", The New York Times, August 27, 2010. ^ For examples see, John Cassidy "Donald Trump Isn't a Fascist; He's a Media-Savvy Know-Nothing", The New Yorker, December 28, 2015, January 16, 2016. James Nevius "Donald Trump is an immigration Know-Nothing, and dangerous for Republicans", The Guardian, August 15, 2015, January 16, 2016. Helen Raleigh "Is Trump Turning the GOP Into the 'Know Nothing' Party? ", Townhall, September 19, 2015, Retrieved on January 16, 2016. Laura Reston "Donald Trump Isn't The First Know Nothing to Capture American Hearts", The New Republic, July 30, 2015, Retrieved on January 16, 2016. Scott Eric Kaufman "Former NY Governor George Pataki: Donald Trump is the 'Know Nothing' candidate of the 21st Century", Salon, December 16, 2015, Retrieved on January 16, 2016. Kiedrowski, Jay (9 September 2016). "Trump: A throwback to the Know-Nothing Party of the 1850s". MinnPost. Retrieved 15 November 2017. ^ "Gangs of New York: The History That Inspired the Movie". ReelRundown. Retrieved 16 November 2017. Anspach, Frederick Rinehart. The Sons of the Sires: A History of the Rise, Progress, and Destiny of the American Party. Philadelphia: Lippincott, Grambo & Co., 1855. Work by K-N activist. Busey, Samuel Clagett (1856). Immigration: Its Evils and Consequences. Carroll, Anna Ella (1856). The Great American Battle: Or, The Contest Between Christianity and Political Romanism. One of Them. The Wide-Awake Gift: A Know Nothing Token for 1855. New York: J.C. Derby, 1855. Bond, Thomas E. "The 'Know Nothings'", from The Wide-Awake Gift: A Know Nothing Token for 1855. New York: J. C. Derby, 1855; pp. 54–63. Wikimedia Commons has media related to Know Nothing. "Know-Nothings" . New International Encyclopedia. 1905.